Crowd outside the Ancien Palais de Justice during Dak'Art. Photo: Oumy Diaw. THE RAP ON SOME BIENNIALS is that they don’t engage enough with the city that hosts them. There was no such problem at Dak’Art 2018, the thirteenth edition of Africa’s oldest and most prominent biennial. Jam-packed into one month—May 3rd to June 2nd—the thing was gargantuan, spreading across Senegal’s capital and beyond. Dakar’s old downtown, with its mix of colonial and postindependence buildings, was home to the main exhibition, organized by the Cameroonian scholar Simon Njami, who also directed the 2016 edition. 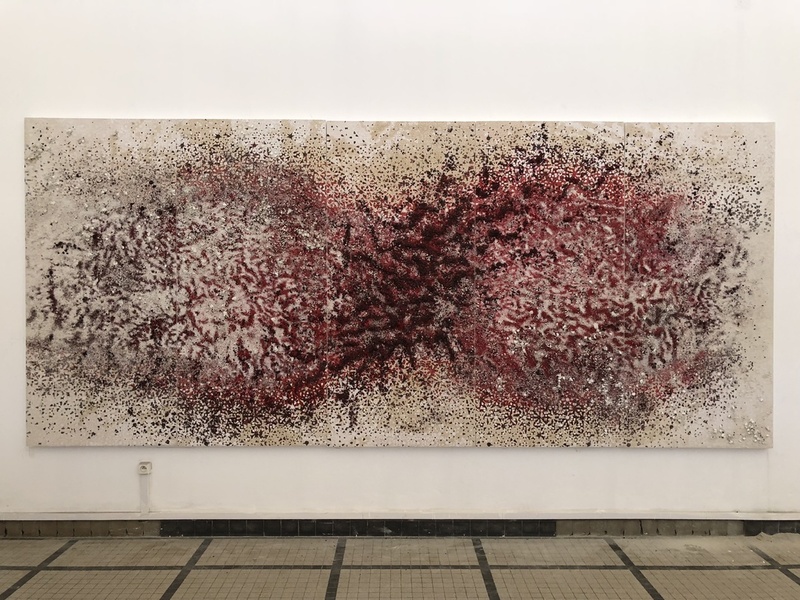 Five exhibitions by guest curators, plus several country-focused shows (Egypt, Rwanda, Tunisia), were within a short cab ride, or a long walk, past landmarks such as Senegal’s Presidential Palace, National Assembly, and the Institut Pasteur de Dakar. But there were also some three hundred fringe events, known as the “Off,” whose locations, marked by red banners, sprawled across this hilly city by the sea—from dense lower-middle-class neighborhoods in the urban core to the villas and hotels of upscale Ngor and Almadies––and even to other parts of the country. The scope of these exhibitions and performances made it impossible to get the full measure of things in a parachute visit. After seven intense days roaming Dakar, I came away full, but frustrated. I missed entire sections of town where art was happening on the street, in community centers, in private homes, and at Cheikh Anta Diop University. 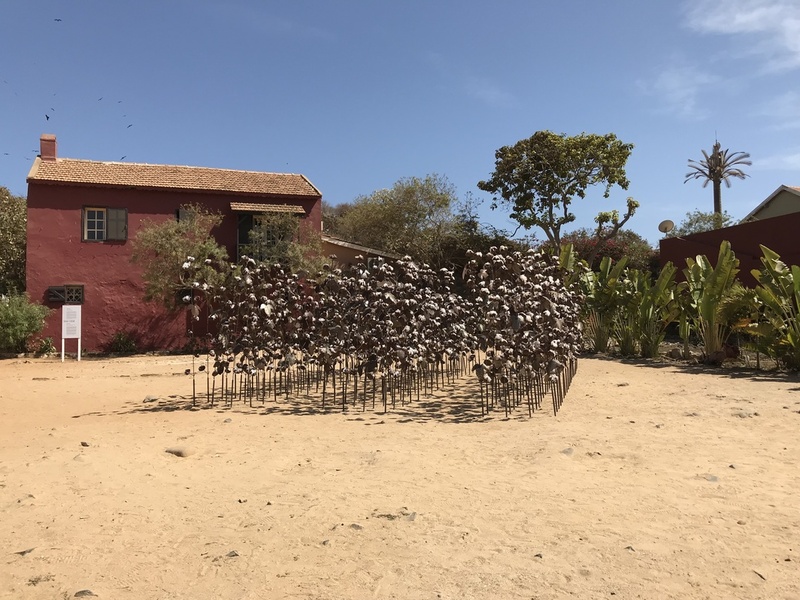 I also never made it to the old colonial city of Saint-Louis, and its photography museum, sculpture parks, and galleries; or to exhibitions in Thiès, the seat of Senegal’s powerful Mouride religious fraternity. Just as you can’t “do Africa” in a lifetime, you can’t do its art in a week. I spent the better part of two days roaming the Ancien Palais de Justice, where the principal exhibition was held. The courthouse complex, built in the late 1950s, is a superb example of midcentury African modernism, with its large atrium surrounded by an airy colonnade and courtrooms and offices in its wings. It sits on a promontory near downtown, fronted by the terminus plaza for several city bus lines. Abandoned in the 1990s, the building gradually decayed until Dak’Art, which is sponsored by Senegal’s ministry of culture, moved in two years ago. 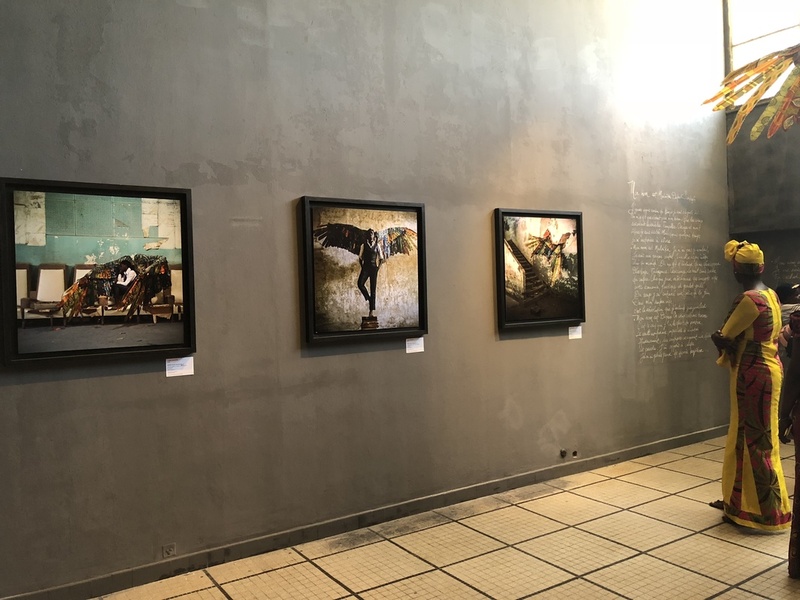 With its grand doorways, fissured walls, rows of seats in the former courtroom balconies, and quiet dirt courtyards traversed by breezeways, it is a highly evocative place to see art, especially art that expresses postcolonial realities. Yasmina Alaoui, untitled - 5 Panel red & white #3, 2018. Photo: Oumy Diaw. Within this grandiose relic were works in pretty much every medium by seventy-five artists and collaboratives from across Africa. I found Yasmina Alaoui’s recent works deeply moving: Made of gravel, salt, camel bone, Styrofoam, and other detritus, all pigmented and mounted on large wood panels, they are contemplative landscapes, literally granular, steeped in the desert’s ecology and trade history. Given sole use of a large skylighted room, Alaoui left her wooden packing crates on the floor, their air-freight labels visible, which somehow compounded their emotional impact. Kudzanai Chiurai, We Live in Silence, 2017. Photo: Oumy Diaw. 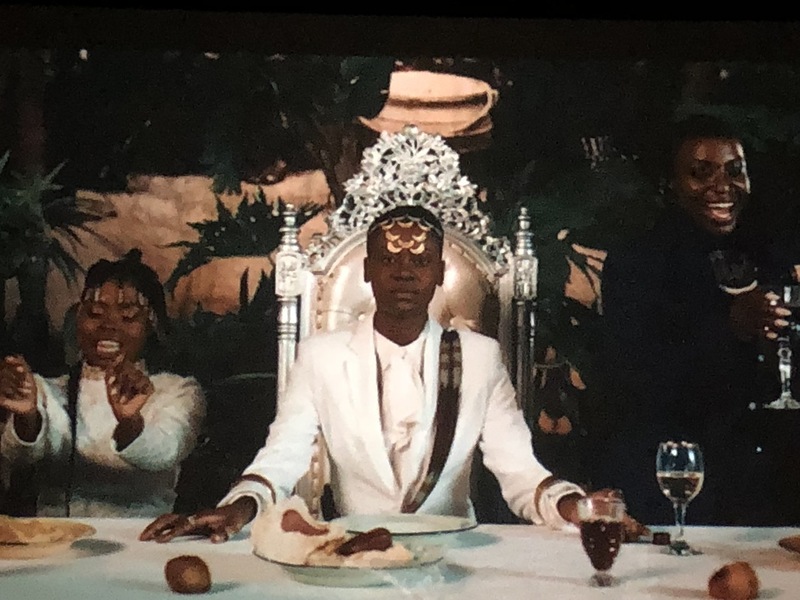 I loved the dark grandeur of Kudzanai Chiurai’s seven-part video We Live in Silence, 2017, a kind of liturgical melodrama on race, gender, and liberation; its aesthetic was reminiscent of Renaissance paintings. Godfried Donkor’s works on paper—specifically on pages of stock and bond data from the Financial Times, modified to include dream interpretation codes, Ghanaian proverbs, and other sorts of information, and overlaid by oil and ink images of prizefighters—brimmed with sly humor about history and globalization. Two separate installations by artists of Algerian origin—one by Amina Zoubir, which centered on her film Last pop dance before darkness, and the other by Katia Kameli titled Ya Rahi—employed sound, video, and objects such as LP jackets to recall the lavish period of Algerian pop culture that insurgency and counterterrorism quashed in the 1990s. Both works conveyed the impact of its vanishing on Algerian society, and on the psyche of its émigrés. Cheikh Ndiaye, Brise-soleil des indépendances, 2018. Photo: Oumy Diaw. 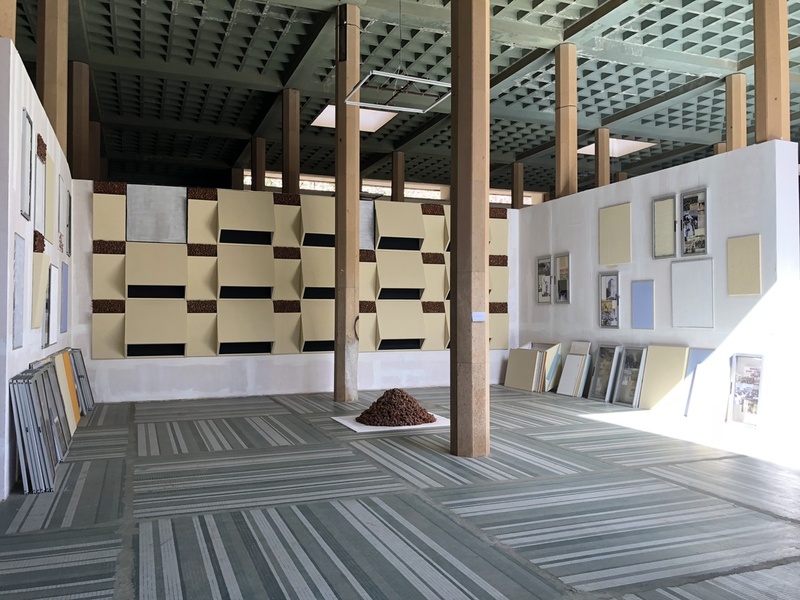 A masterful installation by the Senegalese artist Cheikh Ndiaye, Brise-soleil des indépendances, 2018, combined modernist architectural features, which resembled those of the building in which the exhibition was set, with window panels mounted on the wall or resting in stacks on the floor. On display, too, were archival photos and newspapers from a period of political unrest in Senegal in the late 1980s. An elaborate, encompassing installation of mirrors, cameras, and phantasmal sculpted creatures by Emo de Medeiros, titled )U(, 2018, formed a dystopian environment with a distinct spiritual charge. Ndidi Dike and Amita Makan each presented works in fabric: Dike’s pieces were larger in scale, combining tulle and latex in an uncanny meditation on resource exploitation; Makan’s were more intimate, with diaphanous, intricately embroidered works on swatches of vintage saris, exploring her family’s South African Indian history. Laeila Adjovi’s Malaïka Dotou Sankofa, 2016, featured a sequence of ruminative photographs: self-portraits in which the artist dons Icarus-like wings made of wire and wax-print fabric. This work, expressing the transformation and liberation from postcolonial psychic fetters, received the biennial’s grand prize—apt recognition and perhaps a nod to an adopted daughter (the artist is from Bénin but has made Dakar her home since 2010). Laeila Adjovi, Malaïka Dotou Sankofa, 2016. Photo: Oumy Diaw. Beyond all this stretched the “Off.” Raw Material, an art and residency space in the Point E neighborhood, housed art historian Zahia Rahmani’s audiovisual project exploring two centuries of revolutionary and anticolonial publishing. Cameroonian painter Barthélémy Toguo had a show in a bookstore in the Mermoz district. A showcase of artists from Burkina Faso was held in SICAP Liberté. And on and on: exhibitions by neighborhood artists, disabled artists, students; mobile exhibits and performances traveling the working-class outskirts of Parcelles Assainies; shows in markets, ambassadors’ residences, travel agencies; symposiums on pan-Africanism, on migration, on museum practice. At the Hotel Sokhamon, on a bluff overlooking the ocean, I was stilled by Ivorian sculptor Jems Robert Koko Bi’s elegant set of wood sculptures, which filed in from the water like a parade: first feet and legs, and then hut-like shapes, suggesting a return to origins and to safety for those who were once taken away. I made sure to take the ferry to Gorée Island—a transit point during the slave trade. It is now a tourist attraction, a destination for Senegalese day-trippers, and a settlement where people tend livestock and kids play soccer in the square. A dozen “Off” exhibits focusing on themes of displacement and survival dotted this beautiful, uncanny place. The most stunning was Soly Cissé’s Champ de coton, 2018, a dense patch of tall stalks of reddish welded iron topped by white fibers, invoking the cotton plantations of the New World inside the church square of an island haunted by this somber history. Soly Cissé, Champ de coton, 2018. Photo: Siddhartha Mitter. After this massive cultural offering, what remains? “We cannot sleep between two biennials,” Njami told the audience during a panel conversation over the first weekend. Like other African hub cities, Dakar has a plethora of artists and art initiatives, but the permanent infrastructure to grow and sustain creative work is patchy. After the high tide of the biennial comes a long ebb, during which the thing called “African contemporary art” is shaped as much (or more) by the overseas market—with its institutional collectors and its million-dollar auction sales—as by African ideas and practice. 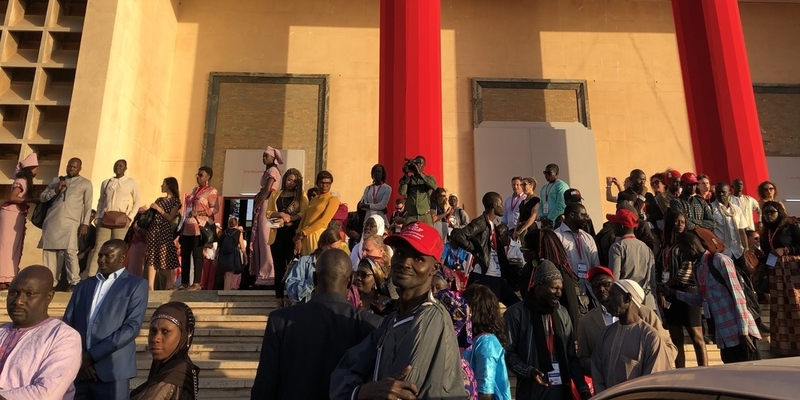 A community of art fairs, galleries, and private museums is taking shape on the continent to address the nascent contemporary-art collector class and intra-Africa cultural tourism, but the process is slow and uneven. Dak’Art itself is showing strain: its logistics, controlled by civil servants, are haphazard, and the whole event needs what Njami called a “more contemporary rhythm.” Its seriousness and firmly African intellectual ownership will only become more necessary as the market expands.